They think it will help the two million parents in the UK who express concern about their child's sleep and ease pressure on the NHS. 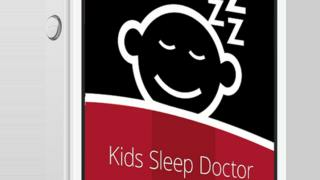 Kids Sleep Doctor gives parents tailored advice, such as dealing with night terrors or up-all-night teens, based on their sleeping patterns. Experts said good sleep was vital for a child's development and behaviour. Paul Gringras, a professor of children's sleep medicine at the hospital, said "massive" waiting lists mean doctors could see "only the tip of the iceberg". So the hospital developed an app that gives personalised advice to parents of 0-16 year-olds to tackle the different sleeping problems that crop up at different ages. Initial advice starts after entering details about bedtimes, where the child falls asleep, how much screen time they have, and caffeinated drinks consumption. "Hopefully they are sleeping in the normal range, but if they're outside that then it advises parents," Prof Gringras told the BBC News website. "Take a five-year-old who suddenly is waking up every night screaming, doesn't recognise parents and pushes them away. "The app would say it is like a night terror and will happen in 10% of children in this age range and they will grow out of it, but they can also try a technique called scheduled waking half an hour after they have gone to bed." In another scenario, it would advise parents of teenagers unable to sleep until really late at night, and are then too tired for school, that exercise in the afternoon is as powerful as any drug for promoting sleep. "These are not annoying daily tips, it's tailored advice," he added. The app has been designed to reduce pressures on the health service rather than make money. It is currently available free on iOS. Android and Windows versions will follow. "I think there's a lot of people it could prevent needing to see a GP. Parents can do a brilliant job," added Prof Gringras. However, the roughly 200,000 children with serious sleep disorders such as narcolepsy or obstructive sleep apnoea would see need to see a doctor. The advice does not apply during the first three months. The app has also been designed in a dark and orange palette to minimise the amount of blue light emitted - which is the wavelength of light that most disrupts sleep. Psychologist and child therapist Professor Tanya Byron commented: "Many children are affected by sleep problems which can have a major effect on the whole family. "Getting a good night's sleep is so important for a child's physical and mental development, behaviour and concentration - to name but a few. "We know parents know their children better than anyone, and I'm confident that the 'Kids Sleep Dr' app will help parents to understand and better manage their child's sleep problems."